Withey's Yard is along an alleyway off the High Street in the centre of Stroud. It is just over halfway up the High Street, on then left as you go up, between Greggs and Moonflower Clothes Shop. The google map of the clinic, here, is mostly accurate so please use that, but it does not show the alleyway. (Also it has Withey's Yard in the wrong place. ) There is an alley between the big Moonflower and Greggs, and we are along there. The map below is out of date: The top of the map is in the west, (not north), Millets has moved west, down the High Street. Just to confuse you, there is a second Moonflower shop roughly opposite the new Millets. 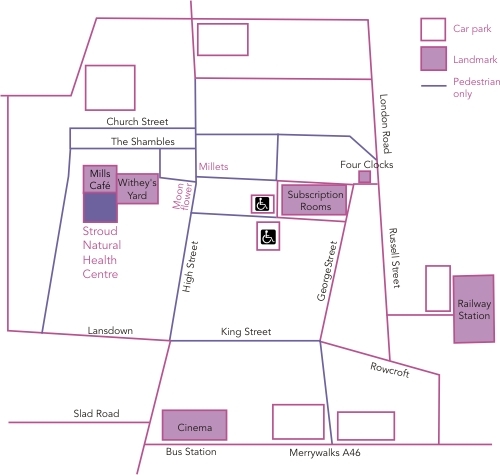 Disabled clients may be driven up the High Street, stopping near Millets. Go along the alleyway next to Moonflower, into Witheys Yard. Please note that the clinic is then reached via a flight of stairs (11 steps).